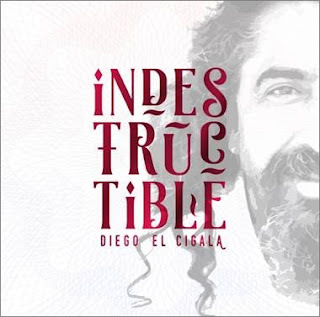 Flamenco singer Diego el Cigala’s latest album, Indestructible, reimagines the classic salsa. Recorded in New York, Miami, San Juan, Puerto Rico and Cali, Colombia, as well as Jerez de la Frontera, Andalucia and Barcelona in Spain, the album features Oscar D’Leon, pianists Gonzalo Rubalcaba and Larry Harlow, trumpeter Luis “Perico” Ortiz, and many of the original Fania studio musicians. Cuban pianist, composer and arranger Bebo Valdés. The meeting led to a collaboration that produced Lágrimas Negras (Black Tears), an album of classics of both popular Cuban music and Argentine tango, reimagined with a flamenco spirit. The record won a Latin Grammy in 2004 for Best Traditional Tropical Album and became a worldwide hit. Since then, Cigala recorded Picasso en Mis Ojos (2005), which won the 2005 Latin Grammy for Best Flamenco Album; investigated Cuban music in Dos Lágrimas, (2008); focused on tango in Cigala & Tango, (2010); and, explored tango and Argentine folk music in Romance de la Luna Tucumana (2013). Indestructible is his most personal project and was a dream shared by Cigala and his late wife and partner, Amparo, who passed away in August of 2015. Stay Thirsty Magazine is excited to feature Diego el Cigala and his vibrant music.